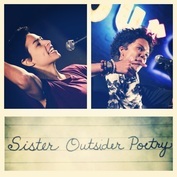 Sister Outsider Poetry is an award-winning duo representing two of the top three female slam poets in the world, Dominique Christina and Denice Frohman. Their tour marks the first time that two Women of the World Poetry Slam Champions have paired up. They have appeared on six national poetry slam finals stages and have six championships collectively. Inspired by the life and work of Audre Lorde, they write and perform their "otherness" into the center and use spoken word as a tool for social change. Dominique Christina is a writer, performer, educator, and activist. She holds five national titles in the three years she has been competing in slam, including the 2014 & 2012 Women of the World Slam Champion and 2011 National Poetry Slam Champion. She is the only person to have won two Women of the World Poetry Championships. Her first book of poetry, The Bones, The Breaking, The Balm is available now. Denice Frohman is an award-winning poet, lyricist, and educator. She is the 2013 Women of the World Poetry Slam Champion, 2014 Canto Mundo Fellow, 2012 Leeway Transformation Award recipient, and 2013 Hispanic Choice Award winner. Her debut album, “Feels Like Home” is available now.